Checklist for Crystal PM minimum system requirements. View the Crystal PM user guide. View the list of Clinical Quality Measures. MS Word template for a single sheet postcard format. 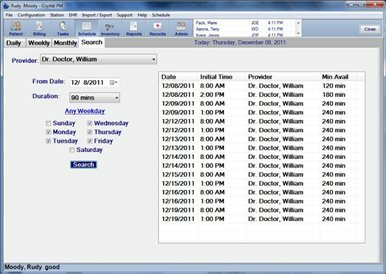 MS Word template for merging patient and schedule data. The ‘backup.bat’ file for use in manually backing up the Crystal PM database. Allows you to view PDF files that are on your computer or have been uploaded to Crystal. **Note: uncheck the box for McAfee virus scan. Allows you to create PDF files from any printable document. Allows you to create PDF files from Windows Applications. Workstation computers to be on the latest version of the Java runtime environment. For questions regarding this software, consult with your IT personnel. This is the access portal for GoToAssist. 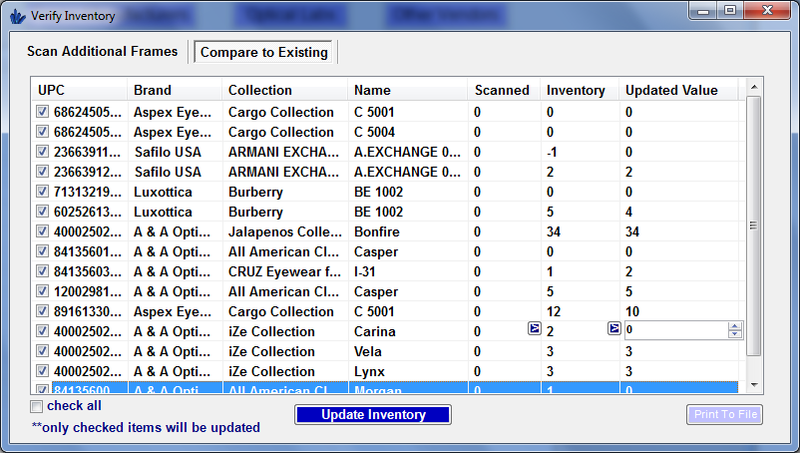 The Inventory module manages your inventory of frames, contact lenses and other miscellaneous items. If the system has been preloaded with the Frame UPC CD, managing frames inventory is streamlined by “auto-filling” when a registered barcode is entered. Click the Inventory button in the Main Toolbar. Each Inventory page provides an overview of the total number of items, by Brand, currently in your inventory for the selected category. From the main Inventory screen for a selected category, you can choose to view the items list for any listed Brand. 1 Select the category for which you wish to view inventory by clicking the appropriate button: either Frames, Contact Lenses or Miscellaneous. Quantity – the total number of items in your inventory for the associated Brand. Brand – the brand name of the associated items. Purchase – the total of the individual purchase prices (paid by your practice) for all items of the associated Brand currently in your inventory. List Price – the total of the individual list prices for all items of the associated Brand currently in your inventory. Sale – the total of the individual sale prices (charged by your practice when an item is sold) for all items of the associated Brand currently in your inventory. You can re-sort the Inventory list using any column as the sort key. Click a column head to sort the list alphanumerically by the selected column. Click the column head again to sort the list in reverse alphanumeric order. 1 Click a line in the main inventory list to view the items list for the selected Brand. The items list contains a listing of individual items for the selected Brand. 2 Click the Back button to return to the Inventory “main” page. 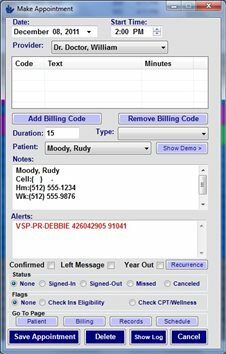 Items are added to Inventory by creating item records for each salable/billable item in your practice’s inventory. Once an item record for a given item is created, it cannot be deleted. 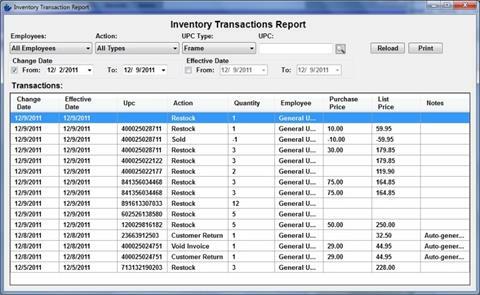 Purchases and sales of the associated items are managed by changing the quantity associated with the item record (see Section 6.4, Managing Inventory on page 6-3 for details). The general procedures for adding an item to Inventory are the same regardless of the category of the item (Frames, Contact Lenses, Miscellaneous items). The only difference is the specific data fields associated with each item. The “main” Inventory page for the selected category displays. 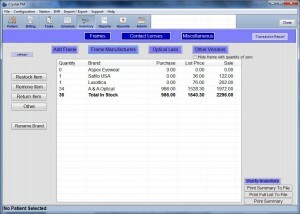 2 Click the Add Frame, Add Contacts to Inventory or Add Item to Misc button, as appropriate. The inventory dialog for the current category displays. 3 Enter the appropriate data for the item being added to Inventory. For Frames: Use the Load Search Boxes with Data From radio buttons to select the source for the Inventory auto-fill feature: either Inventory or Frames CD. When Inventory is selected and you enter a UPC code for an item for which an “item record” currently exists, the system retrieves the current item record and increases the Quantity by. 4 1. When Frames CD is selected and a matching UPC code is found, the data fields are “auto-filled” with the appropriate information. For Contact Lenses and Miscellaneous Items this action is performed without the use of radio buttons. 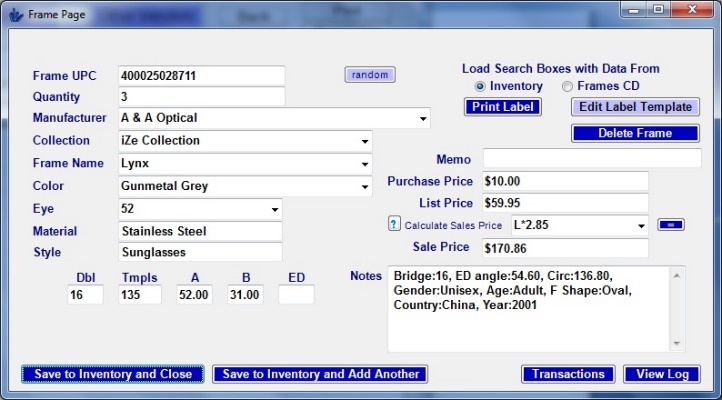 5 When all desired information has been entered, click Save to Inventory and Close to add the item to the inventory and return to the main inventory window, or click Save to Inventory and Add Another to add the item and refresh the dialog window with blank fields. Not all fields are found in all categories. Unless otherwise specified, all fields are optional. UPC the unique Universal Price Code for the associated item. This field is mandatory. Quantity the quantity of the item currently in your inventory. This field is mandatory. Manufacturer the manufacturer (or vendor) of the item. Collection the collection name, number or other designation for frames. Name the name (description) of the item. Color the color (for frames). Material the material of which the item is made. Style the style name, number or other designation for a frame. (Size/Prescription) size, fitting, or prescription data (Dbl, Tmpls, A, B, ED for frames; Base Curve, Sphere, Diameter for contact lenses). Purchase Price the single unit purchase price (paid by your practice) for the item. List Price the single unit list price for the item. Calculate Sale Price for frames only, enter an equation in this field, and then click the button to automatically calculate the sale price. Click the ? button next to this field for instructions on equations. Sale Price the single unit sale price (charged by your practice when the frame is sold) for the item. Notes any additional notes related to the item. When entering pricing information, you may enter amounts in whole dollars (i.e. “5”) or dollars and cents (i.e. “5.95”). The dollar sign “$” is optional. 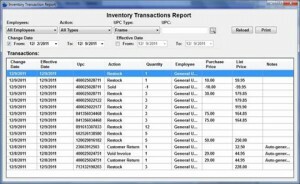 You can edit an item record to update the quantity of an item in inventory as a result of purchase or sale, or to update other data fields in the item record. 6 Select the category for which you wish to edit an “item record” by clicking the appropriate button; either Frames, Contact Lenses or Miscellaneous. The main inventory page for the selected category displays. 7 Double-click the line in the inventory main page for the Brand containing the item record you wish to edit. 8 Double-click the item record you wish to edit. 9 Edit the desired information, as described in Section 6.3 above. You may reflect purchases or sales by increasing or decreasing the total Quantity. If this occurs while editing an item record, the Frame Transaction window will open after saving (see Section 6.4.2 below). It is recommended, however, that sales be logged from the Billing module (see Section 3.3, Creating an Invoice on page 3-3 for details), rather than from the from the Inventory module. Sales from the Billing module will generate an automatic update to inventory, provided the UPC code is entered when the sale is made. The UPC code cannot be edited. 10 When all desired changes have been made, click the Save to Inventory and Close button. It is recommended that returns be logged from the Billing module (see Section 3.10, Product Returns on page 3-12 for details), rather than from the from the Inventory module. Returns from the Billing module will generate an automatic update to inventory, provided the UPC code was entered when the sale was made. However, returns processed in the Inventory module will not update the associated invoices. Instead of changing the quantity in the item record, you can use the buttons to the left of the inventory window to modify inventory quantity. 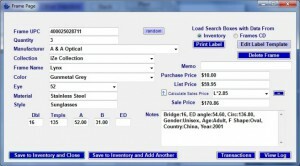 11 Click the desired button: Restock Item, Remove Item, Return Item, or Other. All four buttons will take you to the same screen. The only difference between the button is the pre-populated value in the Type field. 12 Type in a UPC or click the magnifying glass button to browse the inventory. 13 Specify the Quantity (the amount by which the stock is changing). 14 Specify the reason for the change in quantity (Restock, Sold, Remove Item(s), Return to Manufacturer, Correction/Fix Error, or Customer Return), date, and enter any notes if desired. 15 Click Save to finish. The inventory module maintains records containing address and contact information for each vendor and optical laboratory from which your practice purchases products or services. Vendor records are saved separately for frame vendors, optical laboratories, contact lens vendors, and other miscellaneous vendors. For Frame Vendors: Click the Other Vendors button from the Frames Inventory page (see Section 6.2, Viewing Inventory on page 6-1 for details). For Optical Laboratories: Click the Optical Labs button on the Frames Inventory page. For Contact Lens Vendors: Click the Vendors button on the Contact Lenses Inventory page (see Section 6.2, Viewing Inventory on page 6-1 for details). For Miscellaneous Vendors: Click the Vendors button on the Miscellaneous Inventory page (see Section 6.2, Viewing Inventory on page 6-1 for details). By default, the Vendor Page displays information for the first vendor (alphabetically) in the database. 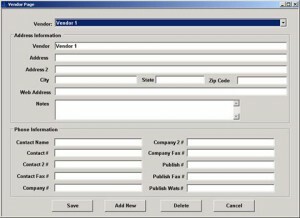 The Vendor Page contains the same data fields, regardless of the type of vendor or optical lab. Access the appropriate Vendor Page for the type of vendor you wish to add. 16 Click the Add New button. The page refreshes to display “blank” data fields. 17 Enter a name for the vendor (or optical laboratory) in the Vendor text box (or Lab text box for optical laboratories). 18 Enter address information for the vendor in the Address, Address 2, City, State and Zip Code text boxes. 19 If the vendor has a web site, enter the appropriate URL in the Web Address text box. 20 Enter any desired notes about the vendor in the Notes text box. 21 Enter the name and telephone numbers for your direct contact at the vendor in the Contact Name, Contact #, Contact 2 # and Contact Fax # text boxes. 22 Enter the vendor’s main telephone numbers in the Company #, Company 2 # and Company Fax text boxes. 23 Enter the vendor’s publish telephone numbers in the Publish #, Publish Fax # and Publish WATS # text boxes. 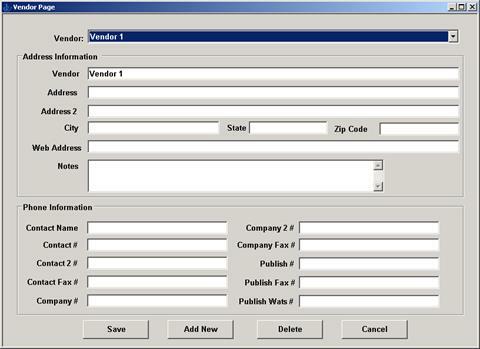 24 When all desired information has been entered, click the Save button to save the vendor record. 25 Access the appropriate Vendor Page for the type of vendor you wish to add. 26 Select the name of the vendor whose record you wish to edit from the Vendor menu (or Lab menu for optical laboratories). The Vendor Page refreshes to display the current information for the selected vendor. 27 Edit the desired information, as described for adding a vendor. 28 When all desired information has been edited, click the Save button to save your changes. 29 Access the appropriate Vendor Page for the type of vendor you wish to add. 30 Select the name of the vendor you wish to delete from the Vendor menu (or Lab menu for optical laboratories). 31 Click the Delete button. 32 Click the Yes button to complete the deletion. To monitor shrinkage and ensure you have each item in stock, use the Verify Inventory function on a regular basis to reconcile your actual inventory against the inventory logged in the system. 33 Click the Verify Inventory button in the bottom right corner of the screen. 34 Enter each item individually, either scanning, typing in the UPC, or browsing for it through the Search for UPC button. 35 Click Scan Another Frame between each frame to scan a new one. 36 When finished, click the Compare to Existing. 37 Select each item you wish to update in the system, or select Check All. 38 Click Update Inventory to change the number in the inventory to the value in the Updated Value column. The Transaction Report feature allows you to see all the recent transactions made on all inventory items and to search for specific criteria. 39 Click the Transaction Report button on the top-right of the inventory screen. By default, the transaction report will show the previous week of transactions for the product category (Frames, Contact Lenses or Miscellaneous) that was open. Employee – The employee associated with the transaction. Action – Restock, Sold, Remove Item(s), Return to Manufacturer, Correction/Fix Error, Customer Return, Void Invoice, Unvoid Invoice, Void Transaction, Unvoid Transaction or All. UPC Type – Frame, Contact Lens, Miscellaneous, or All. 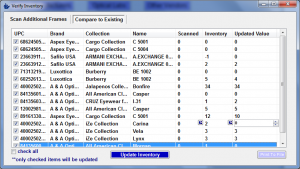 UPC – specify an exact UPC number or click the magnifying glass button to browse the inventory. Effective Date – the date the inventory change was scheduled to take effect. Click Reload to run the report. The Tasks module provides an easy means of notifying office staff of daily tasks, announcements, appointments or other important information. The Tasks window shows a list of Daily Tasks (reminders that have been entered for the current calendar date). Tasks are listed in the order in which they were entered. Messages are color-coded based on the type and current status of the message. When you first launch Crystal PM, the Tasks window displays by default. To return to the Tasks window from another module, click the Tasks button in the Main Toolbar. Announcement – This task type should be used for all general announcement to staff. Announcement tasks are shown in “plain” type in the Daily Tasks list. Important – This task type should be used for any announcement that requires extra attention. Important tasks are shown in “bold” type in the Daily Tasks list. Sign-Off – This task type should be used to track which staff member completes a task or assignment on a given day. Sign-Off tasks are shown in “plain red” type in the Daily Tasks list, with the word “None” shown in the Sign Off column. Keep Active Until Signed Off – This task type is similar to the Sign-Off task, except it continues to display on subsequent days until a staff member “signs off” on the message. Keep Active Until Signed Off tasks are shown in “bold blue” type in the Daily Tasks list. 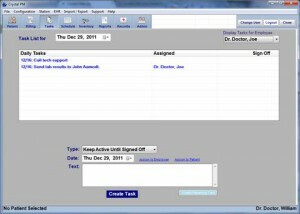 Task messages are displayed only on the day for which they were set, with the exception of Keep Active Until Signed Off tasks. 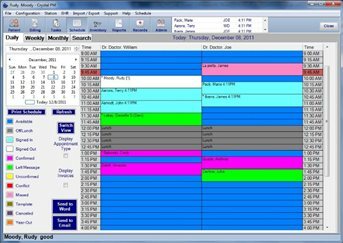 These tasks display on the day for which they were set and on all subsequent days, until a staff member “signs off” on the message. When a Sign-Off or Keep Active Until Signed Off message is acknowledged by a staff member (see Section 4.4.3, Signing Off On Tasks on page 4-4 for details), the message display changes to “green strike through” type. Tasks must be entered for the specific date on which you wish them to display. The number of days for which a task is displayed depends on the task type. Messages are entered using the data fields below the Daily Tasks list on the Tasks window. ¨ The default task Type is Announcement. 1 Select the date on which you wish the task to be displayed from the Date menu. ¨ The default Date is the current calendar date. 2 Enter the desired task message in the Text box. 3 Click the Assign to Employee and/or Assign to Patient link to connect this message to a particular employee or patient, respectively. 4 Click the Create Task button to save the task message. ¨ The Tasks window refreshes to display the added task message. If desired, you can create a recurring task. Recurring tasks are displayed on multiple days according to the schedule you define. 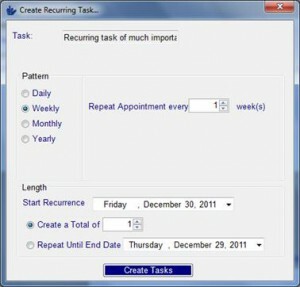 1 Create a new task, following the steps above, but clicking the Create Recurring Task instead of the Create Task button. ¨ The Create Recurring Task dialog displays. 2 Select the Pattern radio button for the basic time increment by which you wish to schedule the recurring message; either Daily, Weekly, Monthly or Yearly, then specify the frequency for the message, as appropriate. 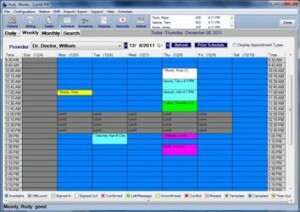 Each Pattern has a unique set of data fields that allow you flexibility in scheduling the frequency by which the recurring message is displayed. 3 Select the period of time during which you wish the message to be repeated using the Length data fields. Select the first date on which you wish the recurring message to display from the Start Recurrence menu. The default Start Recurrence date is the current calendar date. To repeat the recurring message a specified number of times, select the Create a Total of [__] radio button, then select the number of messages you wish to create from the associated menu. To repeat the recurring message for a specified time period, select the Repeat Until End Date [__] radio button, then select the last date on which you wish the recurring message to display from the associated menu. The default Repeat Until End Date is the current calendar date. 4 Click the Create Recurring Task button. The Create Recurring Task dialog closes, and the Reminders window refreshes to display the added reminder message, as appropriate. In the case of long task messages, the full text of the message is not shown in the Daily Tasks field of the Tasks window. You must open the View Reminder dialog for these messages to view the full text of the task. From the Tasks window, double-click the task message you wish to view. ¨ The View Reminder Dialog displays. ¨ The full text of the task message is shown in the text box at the top of the dialog. Click the button to close the View Reminder Dialog. If you wish, you can append text to a task message (see Section 4.4.2, Editing Tasks on page 4-4 for details). 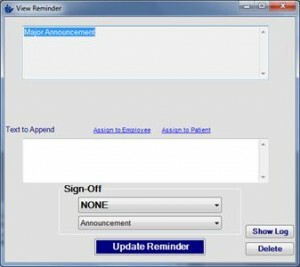 When you display the View Reminder dialog for a Sign-Off or Keep Active Until Signed Off task, the View Reminder dialog includes a Sign-Off menu (see Section 4.4.3, Signing Off On Tasks on page 4-4 for more information). If you wish, you can append text to a task message. This feature is especially useful when working with “sign-off” tasks, when it may be desirable to include details related to accomplishment of the task for which the task was set. Task messages are edited from the View Reminder dialog. 5 Display the View Reminder dialog for the task for which you wish to sign off (see Section 4.4.1, Viewing Tasks on page 4-3 for details). 6 Enter the text you wish to append to the task message in the Text to Append text box. You may wish to include your name or initials at the beginning of the additional text, so other users will know who appended the task. 7 Click the Update Reminder button. 8 The View Reminder dialog closes, and the Task window refreshes to display the appended text. When you view a Sign-Off or Keep Active until Signed Off task, the View Reminder dialog includes a Sign-Off menu. The menu contains a list of all employees defined for your system. You must select your name from the Sign-Off menu, and update the task to complete the sign-off process. The list of employees shown in the Sign-Off menu is maintained by your System Administrator. 9 Display the View Reminder dialog for the task for which you wish to sign off (see Section 4.4.1, Viewing Tasks on page 4-3 for details). 10 If desired, append additional text to the task message (see Section 4.4.2, Editing Tasks on page 4-3 for details). 11 Select your name from the Sign-Off menu. 12 Click the Update Reminder button to complete the sign-off process. The View Reminder dialog closes, and the Task window refreshes with the message shown in green “strike-through” type and your name entered in the Sign Off column. Tasks can be moved to a new day or deleted from the system by Administrative staff only. See Section 9.3.20, Tasks on page 9-23 for more information. Posted in Support, Tasks, Uncategorized. The Make Appointment screen will appear. 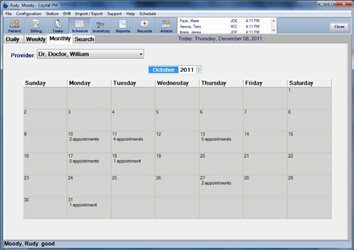 Select the dropdown box to the left of Patient and choose Template Next select Type. (The types listed are the ones you have created under Admin >Schedule>Appointment Types). For this example, I have chosen ‘Phone Call’. The Phone Call Template has now been created. 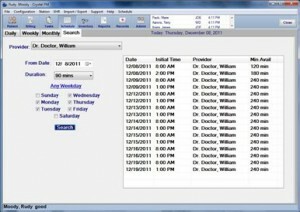 The ‘Duration’ box (showing 15 in this example) pulls from the make appointment screen. You can specify the pattern and repeat options. 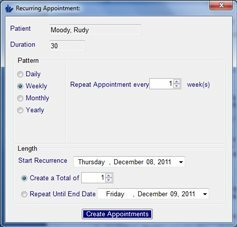 Length allows you to specify the recurrence, the total number of appointments and how long you want to repeat the schedule template. When finished, click the ‘Create Appointments box to finish. If your server fails or if you choose to upgrade to a new machine you will need to manually transfer your Crystal PM database to the new computer. The following steps will demonstrate how to do this. Prerequisites: You will need to make sure that none of your staff are currently working in Crystal and that the program is closed out on all workstations (including the server). You will need to budget for down time (30-60 minutes) depending on the size of your database. An external hard drive, flash drive or network location will be necessary to make the change over. Note: The Crystal PM server/client software should be installed on the new server computer in advance. To begin the database migration, you will need to stop the MySQL database. Click Start > All Programs > Accessories > right-click on the Command Prompt and select Run as Administrator. The ‘administrative’ command prompt will appear. Type in the following phrase where the cursor is flashing on this window: net stop mysql and press Enter. Minimize the Command Prompt and navigate to Start > Computer (or My Computer) > Local Disk (C:) > Program Files (or Program Files X86) > MySQL. Double-click on this folder. The size of this database is 341 MB or 0.3 GB. available on the device (for this example, my device shows 4.06GB free of 7.45GB available). The database will still be on the old server computer and can be deleted once the data has been moved. In the ‘white space’ below the folder right-click and choose ‘Paste‘. This will paste the easyopti folder (from the removable device) into the screen. You will be prompted to merge the new easyopti folder with the existing. Click yes to approve. If a screen appears referring to conflicts, select the ‘copy and replace’ option and check the box to approve for all conflicts. You will be able to access Crystal PM. Note: You will need to provide the server hostname to each of your workstations as you have switched computers and the information from the old server computer is no longer valid. You will also need to open TCP port 3306 in Windows Firewall on the new server computer if you are running this utility. To locate the server computer hostname open the command prompt and type the term hostname. For this example, the hostname of this computer is ‘Loki’. Enter this under Configuration > Server on your workstations and they will be able to connect and write to the Crystal PM database on the server computer. Posted in Admin, General Questions, Support.